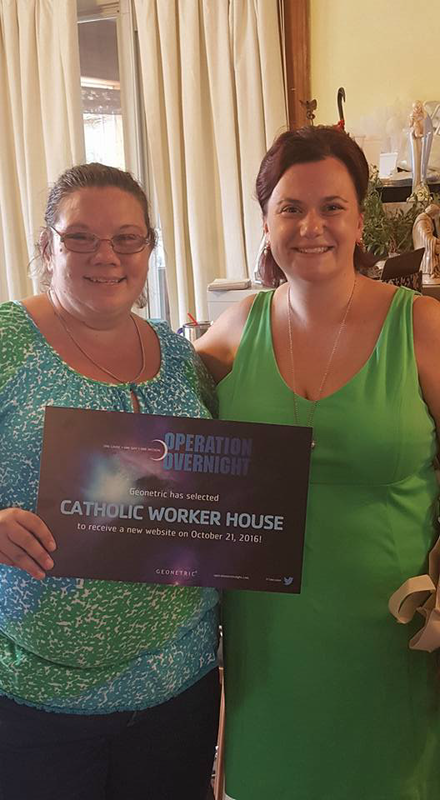 This September begins my 8th year at Catholic Worker House! I am proud of all the progress we have made in the last 7 years! One of the biggest changes we have made is the addition of our website, www.catholicworkerhouse.org . I arrived with minimal computer skills and absolutely NO Web Design skills. I have learned over the years and have been able to maintain our website to the best of my ability. Each year I have applied for a grant to redo our website from Geonetric, and Operation Overnight…and this year was our year! I was so surprised when Anne Ohrt, Facilities and Event Specialist at Geonetrics came to our door in late August with the great news! This year on October 21st , we will have a brand new website! Please stay tuned and check out the current website as well as the new changes to come on October 21st! We are excited and really looking forward to it!